This new Z400 is pretty much exactly a Ninja 400 minus the bodywork, and unlike my naked old R1, it really doesn’t look any the worse for it, depending on how you feel about bodywork. 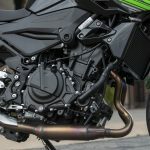 For being a sportbike, the Ninja was pretty dang comfortable already, but Kawasaki replaced its clip-on handlebars with a single bar that places the grips two inches (50mm) higher and at a slightly wider angle, and almost called it a day. 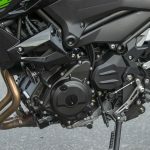 Since the Ninja was already a torquey little badger, there was no need to “retune it for enhanced midrange power,” and so this one should make the same 44 horsepower at 8400 rpm and nearly 25 lb-ft of torque as last year’s Ninja did on the dyno; Kawasaki claims everything in the drivetrain is unchanged right through the slip-assist clutch (with easy-effort lever and wide engagement band), and right out back through the identical final-drive gearing. There was no dumbing down of the suspension either, maybe because it was already rather basic. Not that there’s anything wrong with that. All they did was soften up the springs a smidge at either end and adjust damping to suit. Neither end is adjustable, except for spring preload out back. With it in about the middle of the range, the little Z had no problem propping up my enhanced midrange; I must run about 185 pounds these days all geared up. Sad. 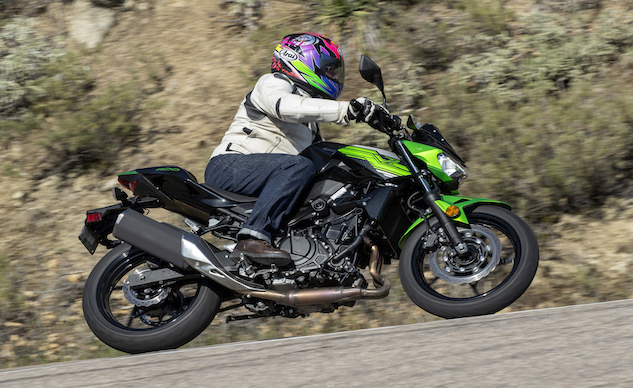 I won’t trot out the old “better to ride a slow bike fast” trope again, as the Z400, like the Ninja before it, is not a slow bike. It’s not a fast bike, but it’s not at all slow. Forty-four horses are plenty when the bike is this light and the roads are as curvy and beautiful as the ones we rode through the freshly rained-upon San Diego County back country, new life springing up like crazy everywhere. 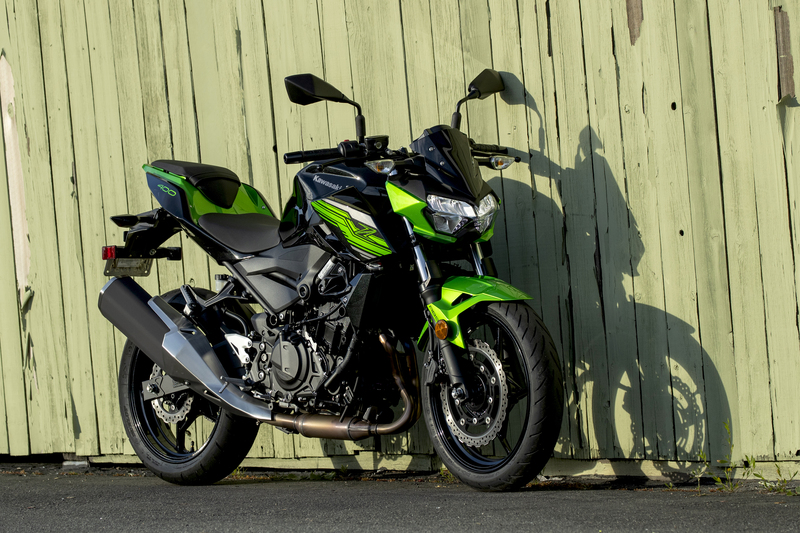 The new Z will rail through the sometimes damp and dirty corners as quickly as anything. 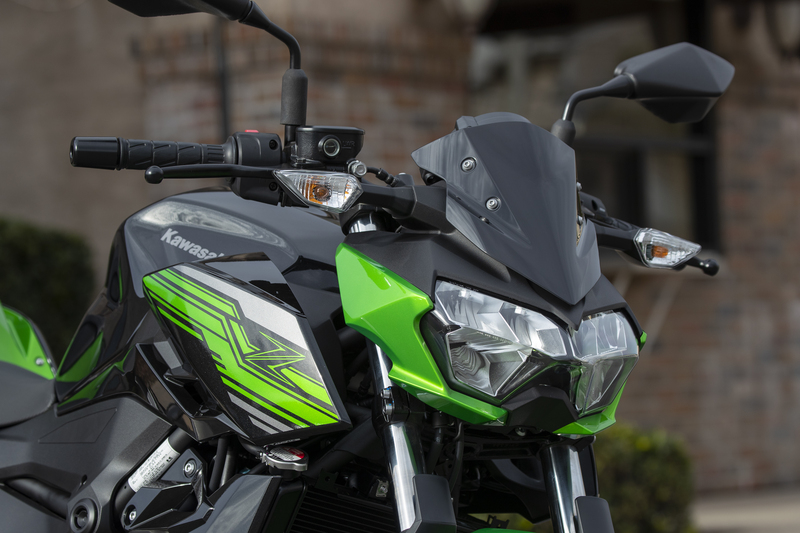 It’s all about the elemental, cheap little motorcycle that can do it all. 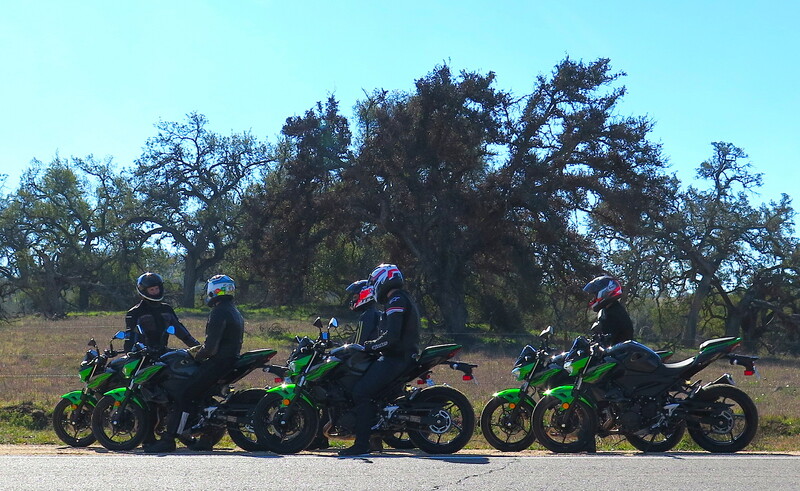 It was a little brisk in the morning, and heated grips would’ve been nice. No gots. No cruise control, no quickshifter, no TFT dash. Normally dry brooks are babbling all over San Diego county, and poppies are beginning to bloom. Little bikes like the Z own the tight stuff. You could blast down the straights faster on something more powerful. But why would you? Um, not that, since there was more than one Z400 on the road, we didn’t blast down the straights when nobody was looking. 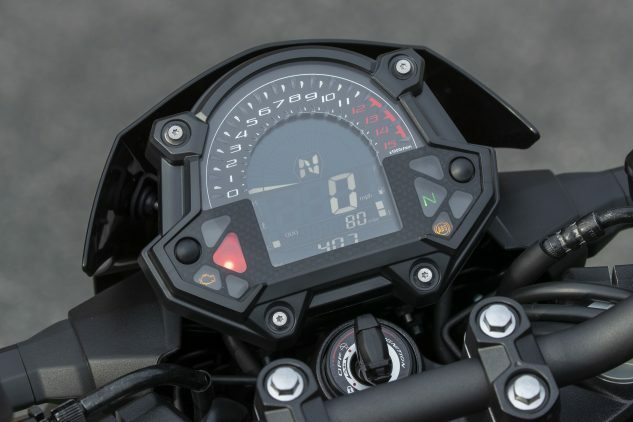 It really is fun to wring the LCD tachometer needles of bikes with 44 horsepower in a way you just can’t quite do on public roads with more powerful bikes. Either the fuelling is damn near perfect or there’s just not enough power to cause abruptness when you open the throttle. Oval shaped butterflies, whose closed position is at an angle in each 32mm intake tract, contribute to instant throttle response and let you get to WOT quicker – a brilliant piece of free trickery that smooths airflow into the Z400’s perky little engine. At no point will the Z rip your arms from the sockets, but there’s always enough power to aggressively attack any public road, and also enough to push the speedo needle right past 100 with what feels like quite a bit more speed to come. Red’s nice. Kawi’s Brad Puetz says Sugomi styling is the spirit of a predator on the hunt, ready to strike its prey. Whatever, man. The Z’s forte, though, is its handling. The best replacement for displacement on tight roads is light weight, and that is the Z’s trump card (an expression that used to refer to a card game but never will again). 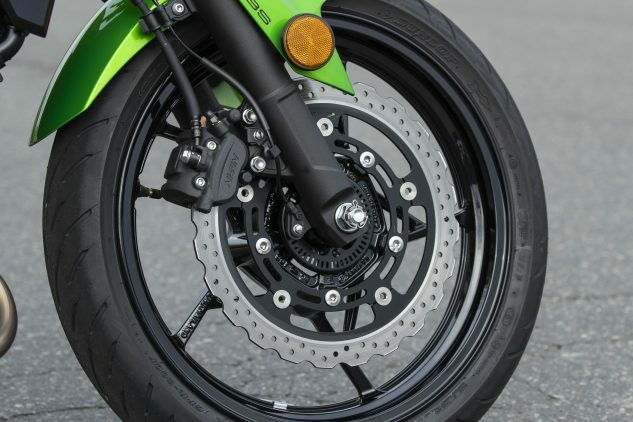 There’s only one brake disc up front and one non-impressive appearing Nissin caliper, but they’ve got enough power to stand the Z on its nose without invoking the ABS, along with plenty of feel, and you can charge far deeper into corners on the Z than you can on a heavier motorcycle (provided you don’t charge into too many of them within a given time frame), with a better chance of coming out the other end. Feel free to tighten your line halfway round with the rear brake – you can’t lock it up. 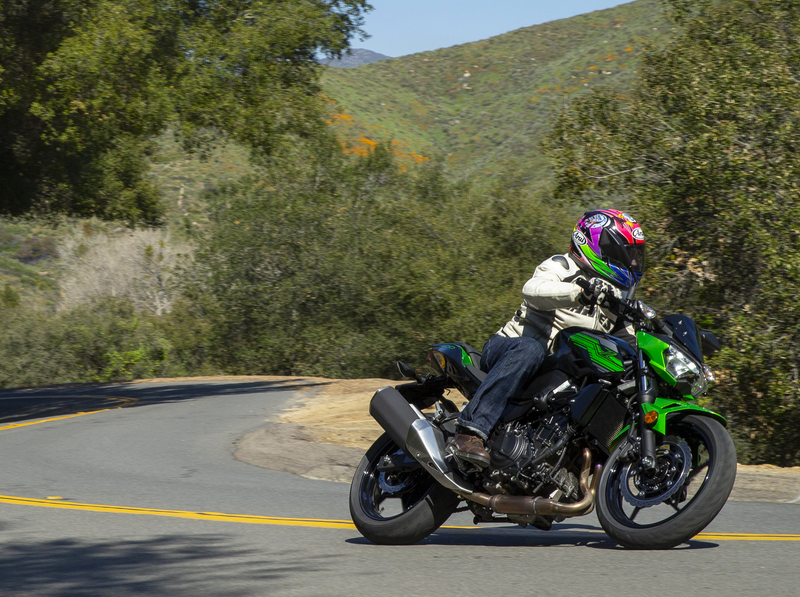 The softer springs in front transfer a bit more weight onto the front contact patch compared to the Ninja, and we were just starting to have a blast in a mad group dash to the top of Palomar Mountain when Kevin Wing made us stop to shoot more photos. Damn. But we got far enough up the road for me to remember the guy on the Ninja 600 who used to destroy all comers on Palomar – another Kawasaki that was famous for its lessness being more. The only place the Z reveals its rude beginnings is over sharp bumps, where that thin seat does occasionally deliver some sharp blows to the editorial undercarriage. 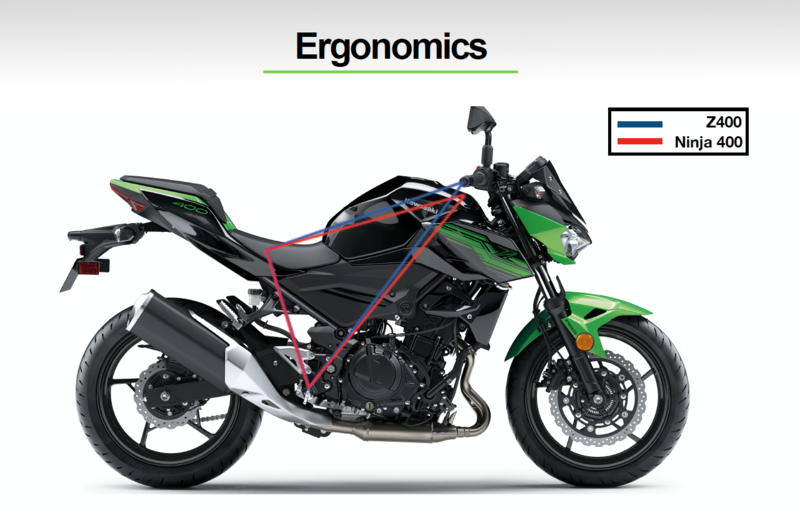 That’s the price you pay for having less weight on your hands than you do on Ninja 400; 90% of the time the Z rides fine. But I digress. 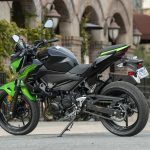 Kawasaki says the Z400 is for riders more interested in commuting and around-town riding than it is for intense peg-scraping mountain climbs and high-speed riding; for those people, there’s already the Ninja 400. Potential Z intenders surveyed liked words such as: cool, hooligan, unique, flying, happy, freedom, serene, superhero, and badass. Light weight and agility are allies for in-town use as well; the Z lifts off its sidestand like a bicycle, and its upright ergos, torquey nature, and super-light wide-engagement band clutch make it a sweetheart in traffic. 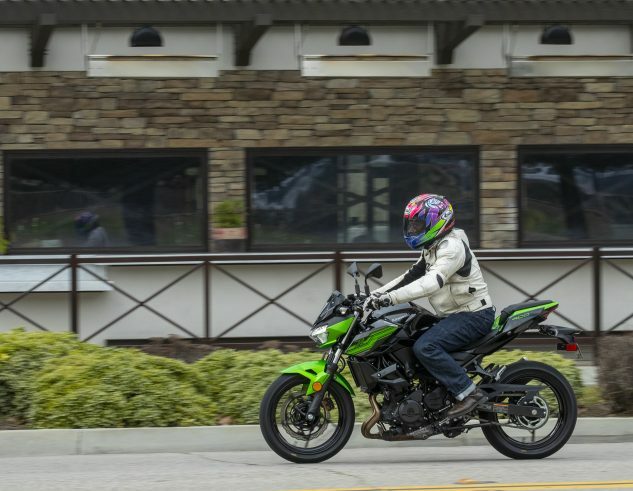 The six-speed gearbox is not Kawasaki’s slickest, but my bike only had 200 miles on it – and it never missed a shift. Rolling at 80 mph and about 7500 rpm on the freeway is no problem either (and there’s already an optional taller windscreen). With the stock one, you remember how nice and quiet naked bikes are if you have a good helmet and ear plugs. No TFT for you. You’ll have to make do with this Sugomi-style LCD thing, which is perfectly okay and has a good gear-position indicator right where it’s easy to see. 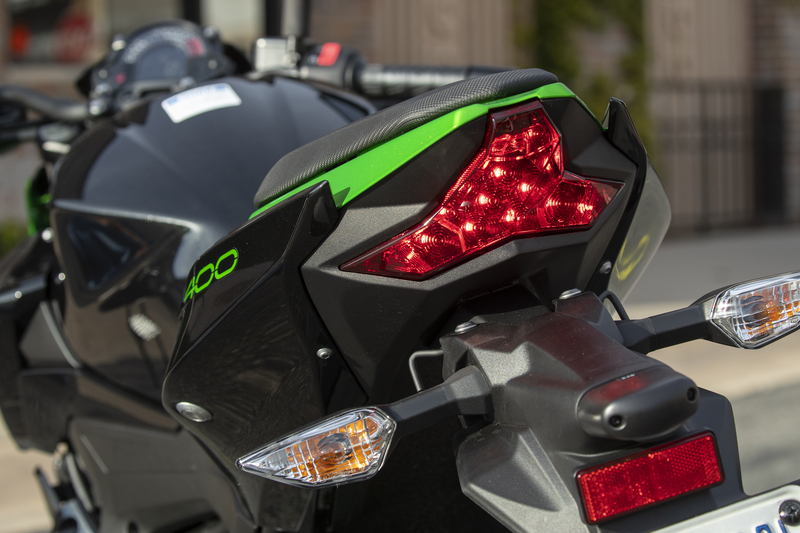 … and the new taillight’s also a highly efficient and bright LED. 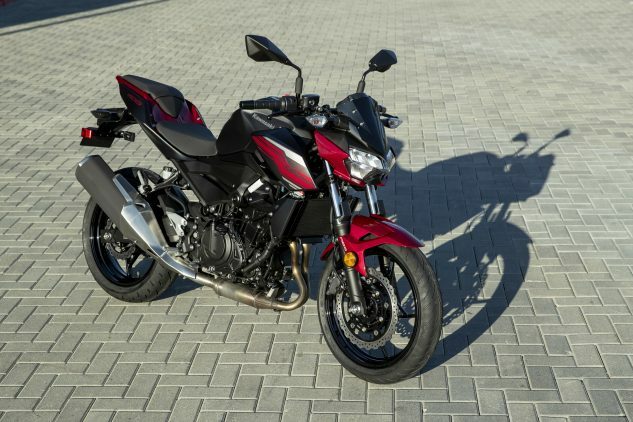 There it is, a perfectly nice, perfectly fun and no doubt perfectly reliable brand new motorcycle nearly anybody can afford. 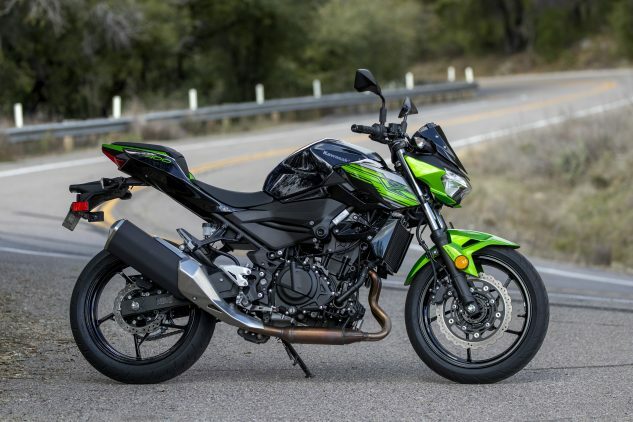 The great Art Friedman used to say nobody needed a streetbike bigger than the old Kawi EX500, and that reminds me of Mark Twain saying that at 18 he thought his dad was an idiot, but by the time he was 30 he was amazed how much the old man had learned in 12 years. 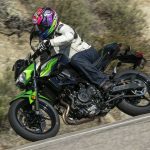 The EX may have been a bit quicker back in its day than the new Z, but the new Z400 is an all-around nicer motorcycle in every way for fewer modern dollars – and if all you want is a friendly, cheap, simple motorcycle for getting around upon – and tearing it up on the backroads now and then – it’ll be tough to beat. Curb Weight (Claimed) 364 lbs.